Extend your reach with our open cloud platform. Domo’s fully integrated productivity suite breaks silos and enables seamless collaboration. Fast, relevant answers with apps. Domo’s open platform means that you can access apps built by partners and developers around the world, and create your own custom apps. Utilize our vast library of connectors. Get up and running with easy access to our collection of over 600 pre-built connectors for the most common data sources. With apps built by industry leaders for specific industries and roles, you don’t have to start from scratch to determine what metrics to track. Use ours or create your own. Browse hundreds of plug and play dashboards, pre-built connector APIs, and apps designed to answer your specific business questions and needs of your specific industry, functional role, and use case scenario. And if you don’t see what you need, build your own custom apps for yourself or for wider sharing in the Domo Appstore. Specific compilations of pages, cards, and other features that give insights for a specific industry, role, or use case. Dashboards with pre-built visualizations for commonly-used data sources. Pre-built API connections to your most important cloud data sources. Check out other Appstore tools—Buzz databots for notifications and help, public datasets, and more. "What we couldn’t accomplish with the previous BI tool, we were able to establish in a week. That includes connecting the data, manipulating the data, and visualizing it in Domo." Explore Domo’s app solutions, built by Domo to address specific industry needs. Build your own apps and connectors. Our developer portal gives you access to all the tools and documentation to create your own custom apps and connectors. Define your app and power it by datasets that reside in Domo. Create the app using Card Builder, our App Design Studio, or App Dev Studio. Use Domo APIs to administer your data and users in Domo. Manage groups and users in your Domo instance. Use our connector IDE to build your own connector to your cloud API. Create and upload data with Domo APIs. Create plug-ins to bring on-premise data into the cloud. 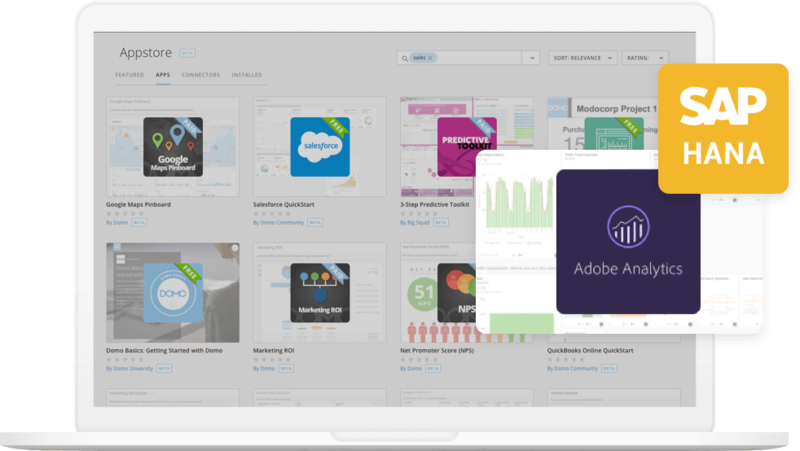 "Various features of Domo, including PDP (Personal Data Permisions), custom apps, and reports, helped us to spur an increase in engagement across our company." Become an app solution partner and leverage your industry expertise to build and sell apps in the Domo Appstore. Get access to our developer tools and create your own sandbox environment. Reach new audiences and customers. Build or expand your offerings on Domo’s SaaS environment. Support for custom app building. Domo Consulting is available to help you build custom apps for your business. Contact us to learn more about options to supplement your in-house development.